Since 2002 he has served as bishop under the Catholic Diocese of Fairbanks. 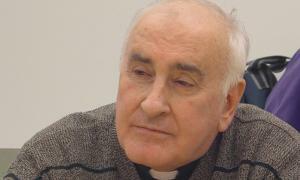 As part of the diocese's legal settlement with sexual abuse survivors, Kettler traveled to the villages of St. Michael and Stebbins in December 2010 to apologize on behalf of the church. This is the edited transcript of two interviews; the first was conducted by reporter Mark Trahant on Oct. 22, 2010, before the bishop's visit; the second was conducted by Trahant and producer Tom Curran on Dec. 7, 2010, after his visit. Tell me about your upcoming trip to St. Michael [in December 2010] and challenges that you're facing there. In St. Michael and in an accompanying village of Stebbins, we've had a great deal of our sexual abuse happen there, very seriously in numbers and so on, primarily from a lay volunteer that lived there over a number of years. So I am certainly conscious of the importance of this visit and trying to reach out to a large number of survivors. So that's in the back of my mind how I might do that.